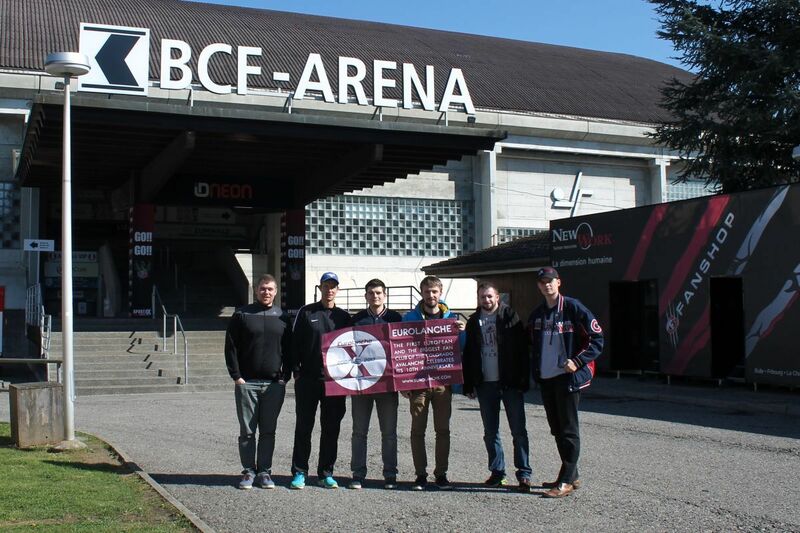 The Eurolanche Fan Club organized a weekend trip to Switzerland to meet with former Avalanche goalie David Aebischer. Eurolanche is celebrating its 10th anniversary in 2017. On this occasion, the Fan Club organized three meetings with former Colorado Avalanche players in Europe over the past months; the most player meetings during one season in its history. After respective meetings with Steven Reinprecht and Uwe Krupp in Germany, five Eurolanche members from Slovakia and the Czech Republic drove from Bratislava, Slovakia to Fribourg, Switzerland to meet David Aebischer – the former backup of Patrick Roy’s and Stanley Cup champion, who later became the Avs’ starter following Roy’s retirement. Before coming to North American, David played in hockey system of Fribourg, where he attracted attention from NHL scouts. After he wasn’t drafted during his first year eligibility, the Avs drafted him the following year in the 6th round, much to his surprise. David spent the following three years in the ECHL and AHL. In 2000, he became Patrick Roy’s backup and got to enjoy the team’s success during a memorable run. Following Roy’s retirement, David became the Avs’ starter. He remained the team’s starting goalie for a year and a half, after which he was traded to the Montreal Canadiens in exchange for Jose Theodore. After another year and a half, he left Montreal and signed with the Phoenix Coyotes, where he only appeared in one game, which was his very last NHL appearance. David returned to Switzerland, where he played for HC Lugano. He attempted a comeback to North America, but spent the entire 2011/12 season in the AHL playing for the Winnipeg Jets AHL affiliate. Afterwards, he returned to Europe for good and retired after playing in the Swiss second-tier league in 2014/15. Since his retirement, David works as a goaltending coach in the Fribourg organization. Currently, he also coaches former Avalanche goalie Reto Berra. The Eurolanche crew left Slovakia on Friday evening and drove for 10 hours before arriving in Fribourg. After a morning interview with David, the group toured the city and continued their journey. The first stop was in Montreux, the Swiss city famous for its beautiful views of Lake Geneva and being Freddie Mercury’s temporary home. Afterwards, they drove to a small town just across the border in France to make the trip even more unique. They spent a night in the Swiss Alps surrounded by amazing scenery. 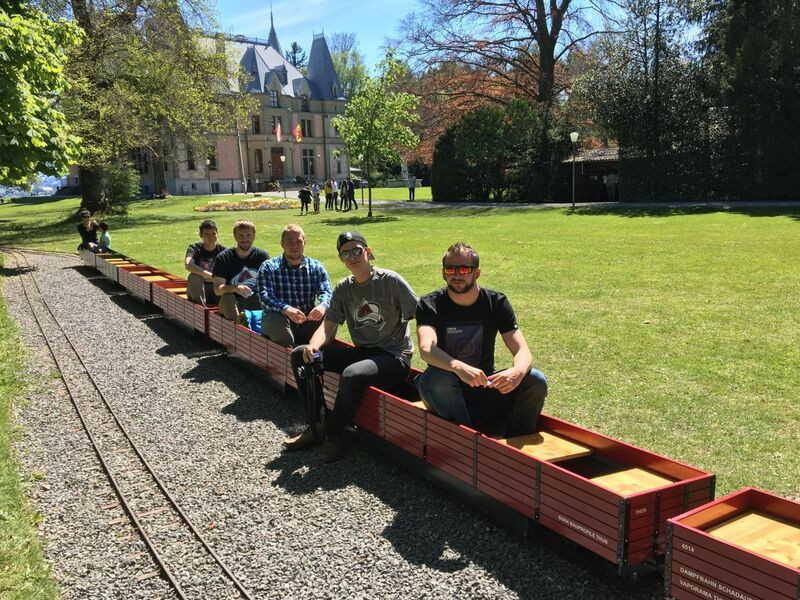 The following day, the crew drove through the Alps, even used a car train, visited the city of Thun, the Swiss capital of Bern and finally spent a night near the Swiss-Austrian border. 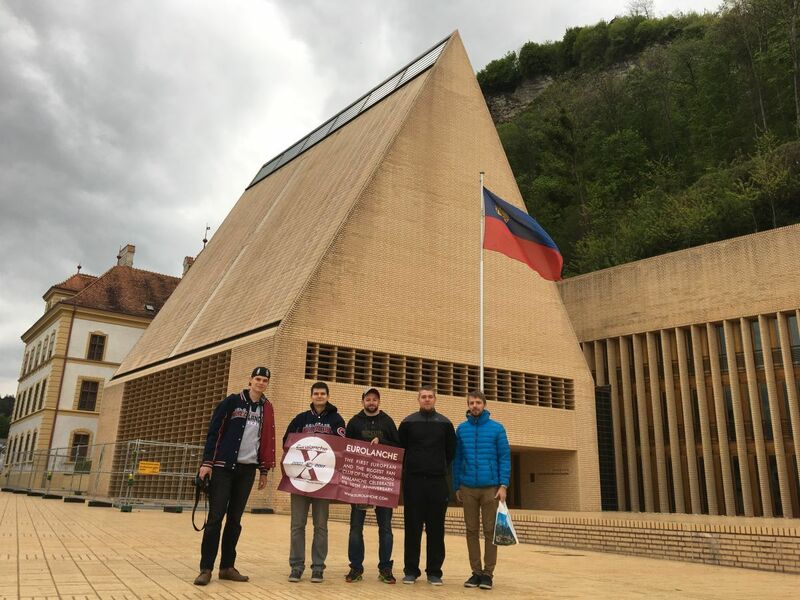 Their main schedule of the final day of the trip included a visit to one of the smallest countries in the world – Liechtenstein – which is situated just between Austria and Switzerland. The Eurolanche group drove 2428 kilometers (1600 miles) in just three days. They had seen a lot of amazing places, which made this trip the best in fan club history aside from the Eurolanche Invasions. Actually, it may be called a “small Eurolanche Invasion”. Be sure to visit our photo gallery and check out a video as well. Can you compare the current hockey system in Switzerland to the one you experienced when you were young in the 90’s? There are a lot of differences. I think the entire Swiss hockey program has evolved. Now, we have better coaches, better infrastructure. The dream of Swiss players playing in the NHL is a real possibility, it’s more real than it was before. When I was growing up, there was no one you could compere yourself to, because no one played in the NHL. That’s the biggest difference. I started when I was about four years old as a forward. I played forward until I was about seven, seven-and-half, then I switched to goalie. Why did you switch to goalie? Did your coach made the decision? No. We didn’t have a goalie during one practice session and our coach asked who’d want to try it. I’ve said that I’d try. I went in and never left. Were you surprised that you were drafted by the Avalanche in 1997 or did you expect to be drafted? No, I didn’t expect it at all. I was eligible to be drafted the year before and no one drafted me, so I knew it would be tough to get into the NHL, especially back then, because it was a little bit different. It’s a funny story. A journalist came to Fribourg for a ski vacation. He also attended two games. As it happens, the starting goalie got hurt. I was the third-string goalie back then. We had a new coach, who decided to put me in and I’ve played well. The journalist went back to Canada and made a couple calls. He called Montreal and Ottawa, who both said no, so he decided to call Pierre Lacroix, who said that he’ll look into it. That’s basically how I got drafted. Do you remember the name of the journalist? Not really, but it’ll come back to me. He was from the Journal de Montréal. So you weren’t in the US during the draft? No, I was back home. My mom woke me up, saying there’s a guy on the phone from the local radio station. I was like ‘Alright’ and picked it up. He asked if he could talk to me about the draft. I said ‘Sure, what do you want to know?’ and he said ‘Congratulations, you got drafted by Colorado’. I didn’t believed it at first and asked him if he was playing a joke on me. I ran downstairs to look it up on the TV and then I saw that I really got drafted by the Avalanche. More than surprised. I expected it more the year before. Thinking back, it really kind of happened out of nowhere. What were your first thoughts after you found out which team drafted you? To be honest, I didn’t really care about it. But then, what was great, was that the team relocated from Quebec, so there were a lot of French-Canadians in the system, which really helped since I speak French my English was non-existent back then. I could identify myself with the Avalanche organization pretty much right away and I still do. Did you know that the team that drafted you won the Stanley Cup just a year ago and that their starting goalie was Patrick Roy? Yeah, I did know all that. I viewed it both as a positive and as a negative – there’s Patrick Roy, which would make it hard to even make the team, as one spot was already taken. Nonetheless, I was really happy. My first camp was great. Coming from Switzerland, which is a good country hockey-wise, I couldn’t believe how fast the players were in comparison to the ones playing in the Swiss league. I was like ‘Wow, this is fast’. So you knew right away that it would be tough to make the roster because of Patrick Roy? I knew it would be hard. Before my first preseason camp, I attended Colorado’s rookie camp with six other goalies. Three of them already had a contract and the team only offered one more contract for a goalie. We were four goalies fighting for a single contract. I got lucky and was the one they chose to sign. What did you tell yourself your objective would be during your first three years after the draft? After the draft, I went to North America and played in the ECHL. I was still 19, so I went back to Europe a couple of times to play at the World Championship. I also came back to play in the playoffs for my hometown team, because that was in my contract. I also played a lot of exhibition games before the World Championship, so there was a lot of back and forth, but it helped me to get more accustomed to North American hockey. I played in Hershey during my second and third year, which is where I realized that I needed to play good in order to make it to the NHL, because you can’t really control anything aside from that. At first, Craig Billington was the Avalanche’s backup, then Marc Denis took his place. Then the expansion draft happened and Marc Denis went to Columbus, which opened up a roster spot for me. During your first year in North America, you played for two different ECHL team. Can you describe your time there? How different was the ECHL from the Swiss league? I think that the quality of the league was a little bit below the standard of the Swiss league back then. The main difference was that you played in small towns. It was like the movie Slapshot, because you played in small towns like Johnstown, but I didn’t really care. I was 19 and I had to go through the learning process. I learned a lot, because you get to play with guys that don’t make any money and have to work during the summer. It was a good experience, because it made me realize that it won’t be easy to make it to the NHL. I realized that I had to work harder than the next guy to make it. You spent the following two years playing for Hershey in the AHL? Did you ever consider going back to Europe after spending so much time in the minors? For me, it was never an option to go back. I signed a three-year contract. Maybe it crossed my mind during the first couple of months when I was in the ECHL, because you miss home, you miss your family, your friends, maybe even the food. But after all that, I never thought about going back to Europe. I had one goal – to play in the NHL. Do you remember how you found out that you’d be the Avalanche’s backup goalie and finally make it to the NHL? I was at the airport to go on vacation to Thailand and I got a phone call from Michel Goulet, who told me to get ready, because Marc Denis got picked up by Columbus in the expansion draft and that I was going to be the team’s backup goalie. He told me to get in shape, to call him in early August and to work with the team’s conditioning coach. Do you remember your first regular season game for the Avalanche? Yes, I remember we played Washington the day before and Patrick Roy beat the NHL record for most wins by a goalie. I knew that I would play the next game after he broke the record. We flew to Columbus, slept there and I found it hard to fall asleep. During the game, I got beat by the first shot I faced. That wasn’t so great, but we won 5-1. Marc Denis, who was Colorado’s backup goalie the previous season, got the start for Columbus, so it was like a duel of the Avalanche’s previous backup against its current backup. We had the better team, that’s for sure, but it was a great win for me personally. You recorded a shutout the very next game, right? Yes, we played the Blackhawks in Chicago and I think we won 2-0. How was your relationship with Patrick Roy? I knew him a little from training camp, but it’s different when you play on the same team. We got along great. It probably helped that we both spoke French. We had a very good relationship, he gave me a lot of pointers, he taught me a lot and ultimately helped me to become a better goalie. Do you regret not playing a game during the 2001 playoffs? Of course I would have loved to play games, especially in the Finals, but that’s the way it is. I was ready, I worked hard during the entire playoffs to be ready just in case something happened. I think I got to play about 30 seconds against LA. Do you know why you played those 30 seconds against LA? They’ve changed the rules by now, but back then, I think we were down 2-1 and were going on the power-play. Our first power-play line was on the ice for a minute. There was a whistle and instead of taking a time-out, Bob [Hartley] made a goalie change so our first PP unit gets some rest, and that’s why I had get ready pretty quickly and get into the net. How do you remember Game 7 of the Stanley Cup Finals from your position on the bench? It was nervous until we got the lead. At one point, I think we were up 3-1. The remaining five or six minutes of the game were just crazy. The arena was so loud you had trouble understanding each other on the bench. It was a great feeling, I mean, you’re counting the remaining seconds and you’re like ‘Come on, come on, let’s get it over with’. It was awesome. What was the atmosphere in the locker room during intermissions? Were there any speeches from coaches or players? It was pretty much the same as throughout the rest of the season. The coach comes in at a certain point, gives the team some pointers. Several players say something. As I’ve said, it didn’t really differ from other games. What was different was the focus of everyone in the room. You could see it looking at everyone’s faces in the room. Everyone was so focused that you knew that once we were up, we weren’t going to lose the game. Do you remember the celebration after the game? Yeah, everybody jumped on the ice, celebrated and took pictures. Then we went to the dressing room and celebrated there. There were a lot of people, some of whom I’ve never seen before, but it was fun. It was a great night. Did you spend your day with the Stanley Cup in Switzerland? Yes, I’ve spend my day with the Cup here. I’ve invited my family and my friends to my parents’ house. I’ve also invited my teammates and took pictures with the Cup. I also took pictures with it all around the city. In the afternoon, I let the fans come over so they could take pictures with it, too. I also wanted young kids who play hockey to have a chance to see the Cup in person. After all that, we had a small party not far from here with all the people that helped me during my career. What Avalanche player did you have the best relationship with? I’ve had a great relationship with Martin Skoula, Milan Hejduk and Alex Tanguay. I think those were the guys I hung out with a lot. There were other guys that came and went, like Steven Reinprecht, with whom I still meet once in a while. He currently plays in Germany, so it’s not that far. I had good relationships with Danny Hinote and Brad Larsen, both whom played in Hershey with me and made it to the NHL at about the same time as I did. Also Scott Parker and Ville Nieminen. Those were the guys I’ve got along the most. Some stayed longer, some left pretty quickly. You said that the last time you’ve been to Denver was two years ago. Was the trip related to hockey or just a vacation? It was around the time I retired. I didn’t do anything for a while and then I’ve been offered the job as goalie coach here in Fribourg. I wanted to prepare for the job, not just take it without any preparation, so I went to Dallas, where I followed the team practices, talked and listened to the coaches during intermissions and so on. I did the same in Denver, where I got help from Patrick and Francois [Allaire]. So it was at the time when Patrick Roy coached the Avalanche? What do you remember from these visits? I remember a lot of things. I went to pregame skates and to the practice rink. What was funny was the fact that the dressing room didn’t change all too much. I mean, there are different pictures and stuff like that, but it has stayed pretty much the same. I knew Patrick, I knew Adam Foote and others from the training staff, so it was nice to come back and meet with some old friends. Listening to Patrick Roy during intermissions, did you notice any differences between him and other coaches? I think every coach is a little bit different in the way he approaches his intermission speeches and other aspects of coaching. I know Patrick. He is… Patrick. He didn’t change. He never tried to be somebody else, which was one of his strengths when he was a goalie and which is one of his strengths as a coach. He’s eccentric and says things how they are. What was your reaction to his departure from the Avalanche? Pretty much the same as everybody else. I was surprised. It’s always tough to judge the reasons. You read about a lot things, but you never really know what really happened. Back to 2001. You were the Avalanche’s backup goalie the following two seasons. How was it compared to your first seasons in North America? The first seasons were special, because everything was new. You learn a lot during your rookie season, you make mistakes and try not to do them again. You learn about making the leap [to the NHL]. In the second year, you’re not a rookie anymore and you have to step up. The same with the third season. I had a really good second year, but got into a slump during my third year. Luckily, I got back on track pretty soon. When Patrick Roy retired in 2003, was it a surprise? Was it something he talked about? Did he said that he’d be done playing after the playoff game against Minnesota? Well, I knew it about two months before he decided to retire. We were talking and he said that it would be his last year. He said that I should be prepared to take his spot. So yes, I knew about it in advance. What was his reaction in the dressing room after his last game? Was he angry or did he behave like he always did? Of course everybody was angry, because we lost Game 7 in overtime. He was angry, but at the same time, he knew it was his last game, so it was pretty special nonetheless. A lot of people wanted him to play one more year, because he had a good season, but then again, he’s Patrick and he put it in his head that he was ready to retire. When were you officially told that you’d be the team’s starter? Two weeks after the end of the season, I talked with the coaches and the GM about it, but I knew that it was only on paper. You had to perform, you can’t just sit back and say that you’ll be the starter. I worked really hard throughout the summer and had a good preseason camp. Overall, I think I had the best season of my career. I played a lot of games and also had moments when I didn’t play that well, but overall, I think I was pretty consistent throughout the season and helped the team reach the playoffs. Why do you think the team ultimately failed that season despite having so many big names on the roster? Well, maybe that was also one of the problems. We weren’t as balanced as we used to be. We had the firepower, no question about that, but compared to 2001, there was something missing. I mean, winning the Stanley Cup is extremely difficult. There’s 16 teams, but only one can win. We beat Dallas, but fell behind 2-0 in the next round against San Jose. We didn’t play very well in those games. We played better in the third game, but lost 1-0. We almost came back to tie the series, but we lost in Game 6 and were eliminated. It could’ve gone either way. There’s a fine line between winning and losing in the playoffs. A lot of analysts and people from the media predicted that you’d win the Stanley Cup that season. Did you also believe that could win the Cup? Of course. With the team we had, we certainly had a chance. Like I’ve said, there’s a fine line between winning and losing and the margin for error is extremely small. There’s no question that we had a chance to win it all, but unfortunately, San Jose was a little bit better at the right time. There’s a memorable moment from your career – a fight against your former backup Philippe Sauvé. How did it happen? It wasn’t really a fight. I think we were up 7-3 or something like that and there was a scrum in front of my goal. I think I pushed or punched someone and he came over, but there’s no bad blood between us. He even invited me to his wedding, so it’s all good. Following the 2004-05 lockout, you were traded to Montreal. Were you surprised by the trade? You’re always a bit surprised. It was a couple of days before the trade deadline. You know that there’s always a possibility that you’ll get traded, but you never really think about it until it happens. I struggled for the first 20-25 games, but picked it up later on and thought that maybe Colorado wouldn’t trade me after all. Then it happened and there’s not much you can do except pack your bags and go play for your new team. I was happy, because I knew that I’ll be going to Montreal and that it’ll be a great experience. At the same time, I was sad, because I felt at home in Denver. It was tough to leave. Do you think that your NHL career would’ve lasted longer if the Avalanche gave you one more chance? Maybe, but that’s just wishful thinking. There are always moments where you say ‘Oh, if this or this would’ve happened, things could’ve been different’, but that doesn’t help you much. You made decisions based on the information you had at the time. I went to Phoenix, because I wanted to play more games and be a starter. I knew that it was a bigger risk than signing with another team as backup, but I wanted to be a starter and I don’t think that I would’ve done anything different. What were your expectations following your trade to Montreal? I wanted to play again, because I wanted to play in the NHL after the lockout. After a year in Switzerland, it felt good to be back in North America. After the first two or free months back home, I just wanted the NHL season to finally start again, but unfortunately, it didn’t happen. After your stint with Montreal, you spent a season in Phoenix, right? It didn’t spend an entire season there, because I went to Lugano not long after they sent me down to the minors. I only played one game for the Coyotes, which we lost 3-0 against Columbus. They sent me down to San Antonio a week after that. I played in San Antonio for a month or two before going to Lugano. Were you loaned to Lugano? No. I had a one-way contract with Phoenix and they sent me down. I didn’t even play in the AHL – I was the team’s third-string goalie. I felt like they wanted me to go back to Europe so they wouldn’t have to pay my salary. All of a sudden, I knew I didn’t have much of a choice, because I didn’t play even after being sent down to the AHL. You have to prove yourself and you can’t do that if you don’t play. Was it tough to leave the NHL? Yes, it was. At the same time, I had the idea of eventually coming back somewhere in the back of my mind. A couple of teams contacted me about two years after I went back to Europe, but it didn’t work out. Afterwards, I went to the Jets’ training camp on a try-out basis and I’ve earned a contract. I played for St. John’s in the AHL and I wanted to get back to the NHL. Unfortunately, it never happened. Two years ago, you chose to retire after just five games. Why? I tore my ACL during the second game of the playouts and was out until the season. I had surgery, rehabbed for six months and then went back on the ice. I didn’t have a contract and wanted to sign with a team somewhere in Europe. I just waited for a good offer. I played with a team in the Swiss second-tier league just to play some games, but I wanted to play in a better league. I wasn’t being honest with myself, I wanted to be challenged. Before Christmas, there weren’t any interesting offers and I told my wife that I’d retire. I kept it to myself, told my family and friends and on January 2, I made my decision public. What do you like about your new job as a goalie coach? I’ve been doing this pretty much my entire life, so I like that I can share my knowledge and experience. I work with all the goalies in the organization, basically with everyone 15 and above. I want to help our goalies reach their goals. Some play the game just for fun, others want to make it all the way to the NHL. I think I can relate with all of them and I want to help them get better. Would you like to become a head coach in the future? I don’t know. We’ll see. Right now, I’m the goalie coach, as well as the team’s assistant GM, so that’s a lot of work, but I like it. It’s interesting. I can train with the goalies, as well as scout opposing players that we could sign to make our team better. It’s an interesting job and I like it. Are there any indications that you could work in the Colorado Avalanche someday? Were there any offers in the past? No, I am yet to receive any offers, but you never know. Despite my current position, it’s still a dream to work in the NHL, because it’s the best league in the world and you can work with the best players on the planet. It’s a challenge and I’d sure love to have that chance one day. 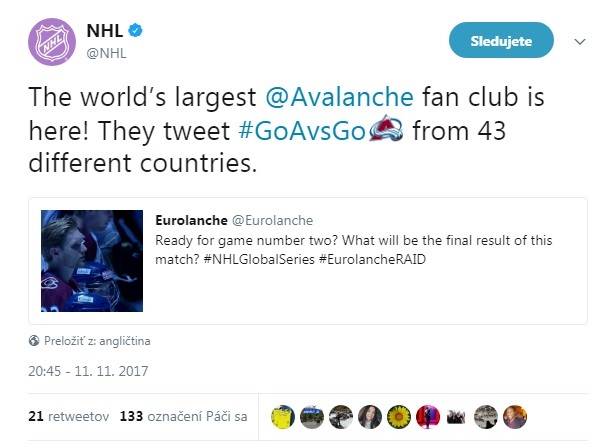 Did you follow the Avalanche during the past season? Do you have any advice for the team, maybe from your perspective as a goalie coach? I wouldn’t say that I have any advice, but the Avs had a couple of difficult years and it comes down to signing and drafting the right players. That’s easier said than done, so hopefully, they’ll do a good developing young players and making the team better. The league’s very competitive and now, we have a new team joining the league, so there are a lot of things you need to do to make a team competitive. You need franchise players. Joe [Sakic] was so important for the organization and I think the team needs another Joe Sakic to get back on track. Were you invited to any Avalanche alumni events? Besides your Stanley Cup Champion ring, do you own any other memorabilia? Well, I own masks and jerseys. That’s pretty much it. Now, I have an 8-year-old son, who never saw me play in the NHL, but he has all these hockey cards and he plays with those. It’s not like I kept everything. I kept jerseys and masks, because that’s the cool stuff for me. And of course the Stanley Cup Championship ring and the little Stanley Cup replica. Those are nice things to have. You said that you were growing up at your local hockey rink. Is there a commemorative wall with photos dedicated to you or something like that? There used to be. There’s a jersey at the arena’s restaurant, but that’s pretty much it. You had a fan club for about 15 years. Can you share any interesting stories? Not many players create their own fan clubs. It was fun, especially when I played in Hershey. When I played there, the fan club made an annual trip to see me play. Back then, there weren’t many Swiss players playing in North America, so I had journalists, TV reporters and of course the fan club with about 20-30 members fly over, attend games and make noise. The players I played with were like ‘What the hell’s going on? This guy’s playing in the AHL and everyone wants something from him’, so that was pretty special. Even though I was playing in the AHL, I had people from Switzerland come and see me all the time. That was fun. Who was your favorite goalie before you got to the NHL? It always changed, but I liked Ron Hextall, Patrick and Felix Potvin, but it always changed a little bit. I think I saw Patrick play the most. When I was 13, I played in a peewee tournament and went to North America to play against Canadian teams the year after, so I probably watched him play three or four times. I liked his style. I attended a goalie camp with Francois Allaire, who was Patrick’s goalie coach back then, so I could relate with him a little bit. After I played with him, I saw that we were built pretty much the same. Sometimes people who watched the game without knowing who was in net weren’t sure who was in net, because we were pretty much the same size. That’s why I probably adored him the most. You said that you were friends with Skoula and Hejduk. Do you know any Czech words? Well, I only know Ahoj (Hello), Čau (Hi), pět minut (five minutes) and that’s pretty much it. Was there a player, of whose shot you were afraid of? No, but you knew about some players that you had to play against more aggressively when they had the puck. You knew that you had to adapt to certain players and their shots, for example against Sheldon Souray’s shot from the point. You knew you had to cover more ice, because it was hard to react to the shot. You just had to make yourself big and hope that it either hits your or that it goes wide. Do you still receive any letters from your fans, for example asking you to sign hockey cards? Yeah, I still get a lot of letters. I get a lot of letter from Slovakia, Czech Republic, Germany, more from all around Europe than from Switzerland.